These bookmarks are two sided and magnetic, great for books or for a notepad. They can also be used as fridge magnets. Cardcaptor Sakura Kawaii Cat Mini Figure with Stand Includes: - Collapsible pink transparent stand with Clow design on base. - Kawaii Sakura mini figure in cat inspired outfit. - Cardboard storage box. From a smoke and pet free home. Bandai S.H. Figuarts - Cardcaptor Sakura: Sakura Kinomoto Figure. Condition is New, in it's original unopened packaging. The articulated figurine of Sakura Kinomoto comes with several accessories, hand parts & alternative facial expressions. Recommended age for this figure is 15 years & older. Dispatched with Royal Mail Signed For 2nd Class. Gale, Siege, Aqua, Reflect, Gravitation, Action, Flight Record, Lucid, Spiral, Snooze, Labyrinth, Reversal, Hail, Mirage, Swing, Struggle, Appear, Blaze,Mirror and the Back of the card. clear card effect. IWe will reply you ASAP. Your kind understanding and patience will be highly appreciated. Size: 16 cm/6". 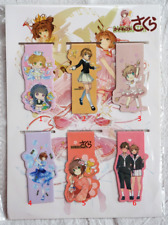 Up for sale is a 15 piece set of Clear Cards from Cardcaptor Sakura: Clear Card Hen. These cards are made from flexible clear plastic with good quality images printed on them. They are only one-sided. IMPORTED FROM JAPAN. Best regards. Quantity:2 pcs. Your kind understanding and patience will be highly appreciated. We will reply you ASAP. Due to the light and screen difference, the item's color may be slightly different from the pictures. Cardcaptor Sakura Clear Card Large Kero - Jaia. High quality plushy of Kero. Your kind understanding and patience will be highly appreciated. Colour :Random. IWe will reply you ASAP. Due to the light and screen difference, the item's color may be slightly different from the pictures. Your kind understanding and patience will be highly appreciated. We will reply you ASAP. Due to the light and screen difference, the item's color may be slightly different from the pictures. Material： Rubber. So that we can try to find the best way to resolve it quickly. Size: 4.5 cm 0.5 cm. If you encounter any trouble. Your satisfactory is our goals. We will provide the best service for you. Cardcaptor Sakura Tomoyo Plush Toreba Prize . Condition is New. Dispatched with Royal Mail 2nd Class. 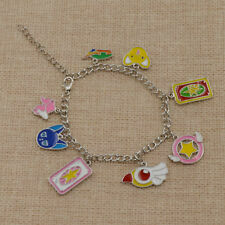 Official Cardcaptor Sakura Rings Japanese Import. Condition is New. Dispatched with Royal Mail 2nd Class. Free UK postage available on orders £20 and over postage refunded after purchase. Your kind understanding and patience will be highly appreciated. Due to the light and screen difference, the item's color may be slightly different from the pictures. We will reply you ASAP. 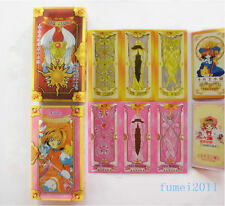 Cardcaptor Sakura bundle. Includes 60th anniversary edition of volume 1, a leather charm bracelet, one sakura card (top right) and two key rings. All bought from the limited shop in Tokyo December 2017. Items authentic and in new condition. Taking offers! L 150mm adjuster approx. 30mm (material zinc alloy, polyester). H20mm x W57 x D5mm. L220mm (material: zinc alloy). Brand new still sealed. Cardcaptor sakura sleeping kero plush cushion. The cushion measures about 14 inches in size and is super squishy. The cushion has never been out of its packing and has it's original tags. From a smoke free pet free home. He's been part of my collection but had been in storage for 4 years and need to clear some room. And he deserves a loveing new home. Any questions please ask I'll try to answer the best I can. 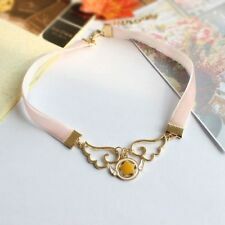 ❀ Cute and Fashionable, the hairpin is great for cosplay or for casual use ❀. 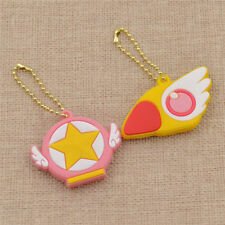 Available Character--SAKURA RARE ITEM Cardcaptor sakura clear card arc Plushy. Condition is New. Official item from Japan. I will be sending it via royal mail 2nd class signed so you can track your parcel after. Beautiful Cardcaptor Sakura Pointer Pens. Sold as a set of 3. Ideal for collectors.